Easier rate setup for bed & breakfasts, vacation rentals and hotels. We have added a new type of rate categories to the system. The new rate categories are easier to use and more flexible. This section describes the benefits of the new rate categories and how to start using them. If your WebReserv account was set up before November 10, 2010, you will need to enable the new rate categories. Go to Setup – Rates – Rate Categories and click the link Click here to enable new rate categories. When you click the link, a number of standard categories will automatically be added to your setup. You can then adjust the new rate categories as necessary. Once you have enabled the new rate categories, all new rate lists will automatically be using the new rate categories whereas old rate lists will continue to use the old rate categories. We recommend that you try out a few rates using the rate tester to ensure that the system is calculating your rates the way you want it. This entry was posted in Booking Calendar, New Features, Rate Calculation and tagged b&b booking system, bed and breakfast booking system, boat rental boo, bookign system rate setup, car rental booking system, how to, RV rental booking system, setup rates, webreserv easy rate setup. For example, you can create a discount code that is valid for only for visits that are minimum 2 days and has 5 persons or more on the reservation. To set up discount codes, log on to your WebReserv account and go to Setup – Discount Codes. This entry was posted in Discounts, New Features, Rate Calculation and tagged booking calendar discoutn code, discount code rules, new feature. 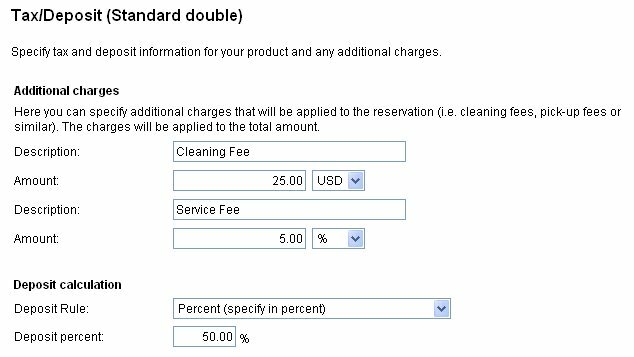 A new feature on WebReserv.com makes it easy to add a percentage service fee to a reservation. The percentage service fee is calculated of the base rate (i.e. the price of the products) but before additional charges and taxes. To add a percentage fee to a product, go to Setup – Products & Reservation Rules – Select Product – Tax/Deposit. 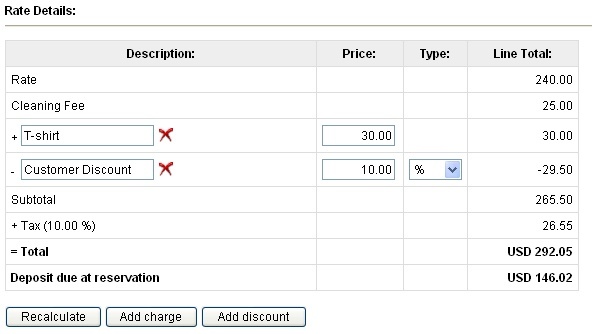 Enter a description for the charge, enter the percentage and select % as the selection. This entry was posted in New Features, Rate Calculation and tagged adding cleaning fees, adding service fees, cleaning fees, how to, how to add service fees, service fees. WebReserv now supports a new rate option: per person (flat), which makes it easier to set up flat rates for reservations. At the same time the rate setup has been updated to make it easier to enter the rates. As of August 31, 2009, when you create new rate lists, the rate that is entered in each column is the total rate for the number of people in that column. In the example below, the rate for the first two people in the Standard Double room is $200.00. There is an extra charge of $50.00 per person, so the rate for three people is $250.00 and the rate for four people is $300.00. Existing rate lists are not affected by this enhancement. This entry was posted in New Features, Rate Calculation and tagged webreserv new feature. You’ve probably experienced the situation before: a customer calls to make a reservation and they would like to check in early or bring pets or have the fridge stocked before arrival. There is no way for you to record the extra charge, so instead you have to write it on a piece of paper and hope that you’ll remember to get it added to the guest folio. With the latest enhancements from WebReserv, you can now add extra charges and/or discounts with a click of a mouse. To add a charge or discount, simply open the reservation and click Add charge or Add discount. You can add as many as needed. For discounts, you can choose either a fixed amount or a percentage discount. When you are done adding lines, click Recalculate to get the new total amount. The additional line items will be stored with the reservation (remember to click the save button when you are done) and is also included in printouts. You can even use the new feature as a simple POS (Point-Of-Sales) system. Simply add additional charges to the reservation as needed and when it’s time to settle the bill, open up the reservation to get the total amount. If your WebReserv account is set up for credit card transactions, you can easily charge the outstanding balance by clicking the link view/update payment details. This entry was posted in Discounts, New Features, Rate Calculation and tagged add charge, add discount, handling reservation, managing reservations, webreserv reservations. Discount codes are a very powerful way to increase sales to new and existing customers. By offering a limited-time discount, you encourage your customers in several ways. First, everybody loves a good deal and by offering a good deal to new or existing customers, they are more likely to do business with you instead of somebody else. A time-limited discount encourages your customers to make the reservation now instead of waiting, which also helps to drive sales. And finally a discount is a useful tool to increase business during slow periods. The latest version of WebReserv now offers support for discount codes. You can add discount codes to the system and your customers can apply the discount codes to reservations during the reservation process. To add a discount code, go to Setup – Discount Codes (http://www.webreserv.com/setupdiscountcodelist.do) and click Add new discount code. 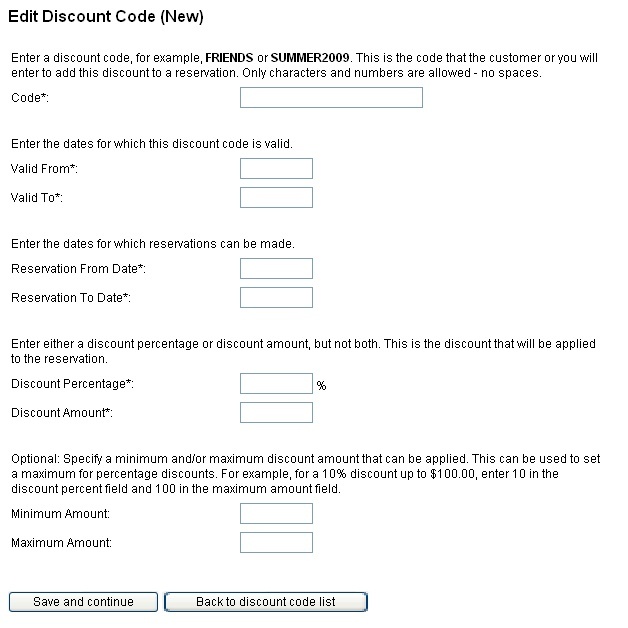 You will now have an empty discount code field as shown in the screenshot below. Code: This is the code that must be entered in the discount code field when making a reservation. A code can be up to 20 characters long and consist of characters or numbers, but no spaces or special characters. Use easy to use codes such as SUMMER08 or FRIEND. If you are advertising through several channels, for example flyers and ads, you can create a different code for each type of ad and use the code to track the responses. To control when a discount code can be used, enter a valid from date and a valid to date. A reservation must be booked within the valid from and valid to dates for the discount code to be valid. You must also specify a Reservation From date and a Reservation To date. Use these dates to specify when the reservation must start for the code to be valid. Finally you must enter either a discount percentage or a discount amount. This is the discount that will be applied to the reservation. The discount will be applied before taxes, if any. 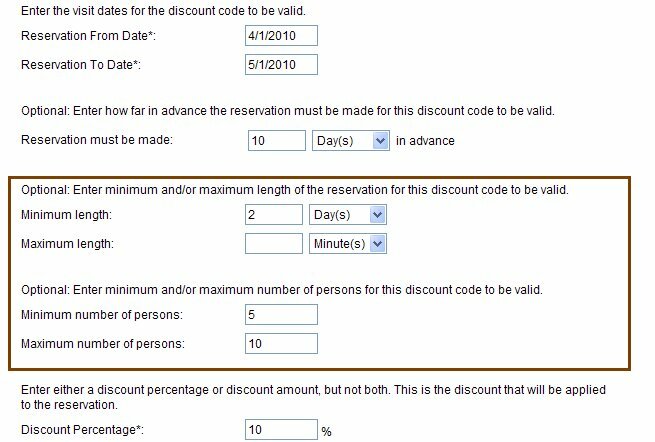 When using a discount percentage, you can also specify a minimum or maximum discount amount. Use can use this feature to give a percentage discount up to a certain level, for example, 10% up to a maximum of $100.00. When you have entered the discount information simply click Save and continue and you will be taken back to the list of discount codes. 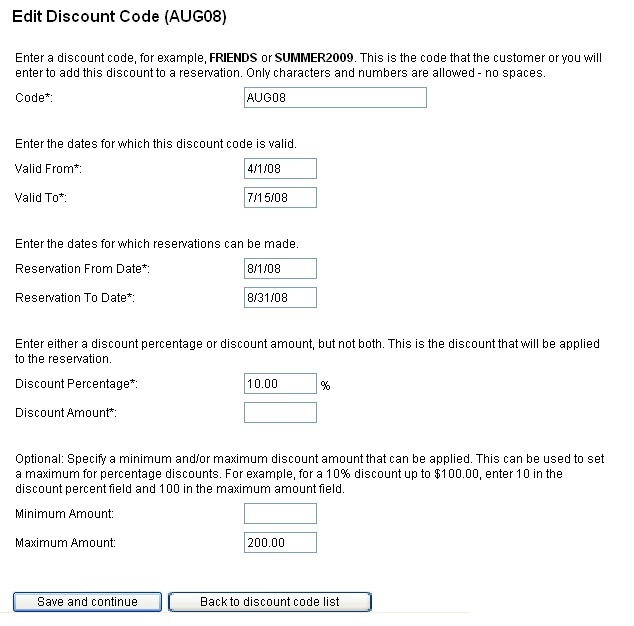 WebReserv.com will automatically show a discount code field in the payment section whenever one or more valid discount codes exist for the selected product. If no discount codes are valid, the discount code field will not be shown. The discount features is available in all premier WebReserv accounts (Silver and Gold). For more information or questions, please contact WebReserv.com support. This entry was posted in Booking Calendar, Discounts, Payment Systems, Rate Calculation and tagged bookings, Discounts, online reservations. New “round-up” feature for rate calculation. A new “round-up” setting enables the reservation system to pick the rate that is higher than, or equal to, the length of the reservation. The round-up is typically used when a rental has one rate up to a specific length of time and a different rate after that time. We want to set a rate for $45 for the first 4 hours, and $90 per day after the first 4 hours. To use the round-up rate, go to Setup – Products & Reservation Rules and select Reservation Rules. In the Rate Calculation Field, select Round Up. Next we need to enter the rates. Go to Rates – Edit Rates for your rate list. If the time frame (4 hours) is not listed, click on the add times links to create a time frame for 4 hours. Go back to the Rate Setup screen and enter the rates for 4 hours and the daily rate. You can also use the round-up to provide a discount when reserving more than a certain number of days. Say for example that you want to charge $90 per day for the first 3 days, but if a reservation is 4, 5, 6 or 7 days, you’ll charge a flat rate of $360 (4 day rate). Simply create the time columns for 2 and 3 days and enter your rates as shown below. See our link for more information about rate calculation. This entry was posted in New Features, Rate Calculation and tagged round up, webreserv rate calculation.